I've had this tire wear for weeks. I sometimes see it a few times a year but I've never had it last this long. What gives?? 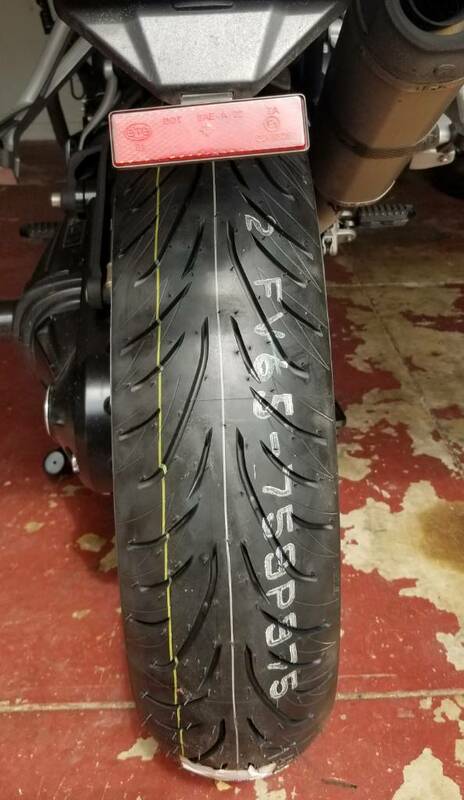 Bridgestone T31 at proper pressure. Same issue on the front. Hmm that's a likely possibility. You think a big multi-day ride would help? Might have to drive my car until I can figure this one out. Maybe the bike needs more power? That's what I was thinking but this bike has 100 more HP than my RC390 with normal looking tire wear. I'll continue diving into this. Thanks for all the suggestions. Last edited by Colorado Mike; 11-17-2018 at 06:27 PM. Was looking at those T31 for my Vstrom... what kinda mileage you getting out of those? Looks pretty good! Before these I was on the T30 EVO and got 15k miles out of the front and roughly 7,500 average on the rear (two rears). I am no longer commuting with my Tiger so not sure what these T31's will do but I am expecting similar results. Let's circle back in here around, say...Dec. 3rd?